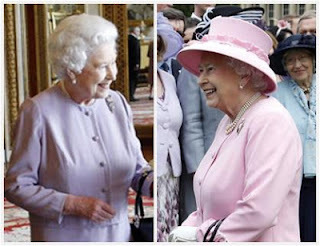 The Queen held audiences at Buckingham Palace and received the Worshipful Company of Gardeners, who presented her with a replica of her coronation bouquet to mark the 60th anniversary of the coronation. Later, she hosted a garden party, accompanied by other members of the royal family. You know, I almost said yesterday how nice it was to get the Kent Amethyst instead of this one...and here we are! She's gonna need a bigger purple selection if we continue on like this. 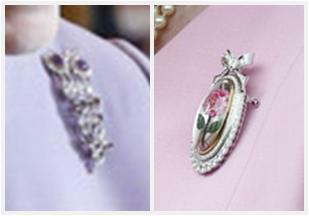 Anyway, receiving a bouquet calls for a bouquet brooch of one sort or another. Click here for an article about the replica bouquet. For the garden party, she brought out one we haven't seen in close to a year - and the last time we saw it, it was on this same outfit, pink and bows, practically too sweet. Click here for an article on the garden party, which was the first one attended by Princesses Beatrice and Eugenie (who somehow managed to leave the statement hats to their aunt Anne).